Digital camera. The resolution of modern digital cameras today is ideal for printing large photos. Check old photos you have taken or those images shot recently. You can choose the best images, do some design revisions then print them online. Custom designed images. You can also make your own design from scratch. UPrinting.com provides the Easy-Design tool where you can add images, text, shapes and choose your preference of colors. Desktop images. 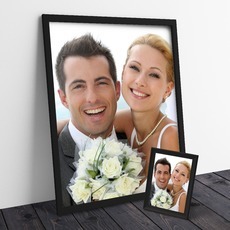 Pictures from your computer can also be used for photo enlargements. Choose an image with 300dpi (dots per inch) resolution to produce quality pictures into a size of a big poster. For design assistance and other queries on ourphoto enlargement services, you may call our customer service representatives available Mondays thru Fridays.